The title of this painting is a quote I found many years ago that supposedly David Bowie said about Bob Dylan. I believe what it means is that Dylan had an extraordinary ability to write his lyrics about the most mundane stuff, yet he managed to expose these topics and the people of his songs right down to their essence right in front of our eyes and suddenly, that which we never noticed, became apparent. Sometimes it takes someone to point something out to us in order for us to notice it, to really see it. For the painting I took the essence of the quote to represent Jesus, not the Christian conception of what he ought to be, but perhaps what he really might have been like. A few years ago, I listened to the most “correct” translation of the oldest texts of the Bible cover to cover. There were a few moments where I felt I was listening to the remnants of a consciously evolved person, whose ideas were more Buddhist than anything else. Much of the rest of it seemed like after thoughts, added by people who couldn’t really grasp those initial meanings. I used Alchemical, Rosicrucian and archetypal imagery to attempt to tell the tale of who Jesus might have been, and what his ideas could have meant, and how in fact, these same teachings are just as relevant today as they ever have been. I invite the viewer to shed their preconceived notions of what Jesus supposedly was, and open the eye of our higher selves and see what he’s been trying to show us all along. 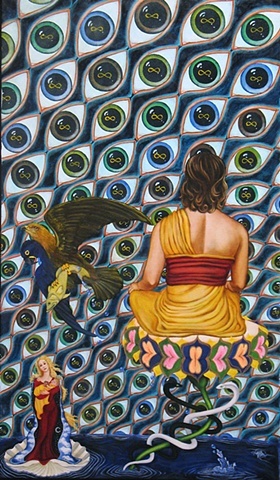 This painting is in the collection of Daniel Jimenez.